GENESIS Structural Design Optimization Software GENESIS® is a fully integrated structural finite element analysis and design optimization software package. Analysis capabilities include: static, normal modes, direct and modal frequency analysis, random response analysis, heat transfer, and system buckling calculations. Design optimization is based on the advanced approximation concepts approach to find an optimum design efficiently and reliably. Actual optimization is performed by the well established DOT and BIGDOT optimizers, also from VR&D. Design capabilities include: topology, shape, sizing, topography, topometry and freeform optimization. • Fast, reliable and accurate finite element analysis. • GENESIS provides improved designs at reduced cycle times. • Topology optimization at early stage of design. 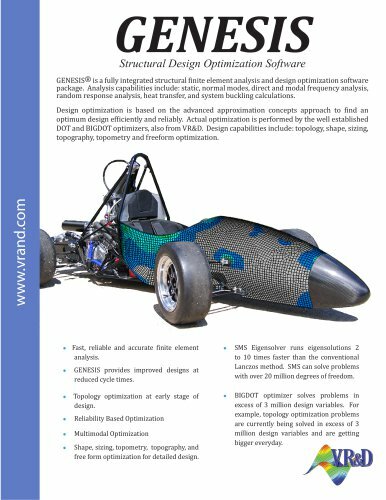 • Reliability Based Optimization • Multimodal Optimization • Shape, sizing, topometry, topography, and free form optimization for detailed design. • SMS Eigensolver runs eigensolutions 2 to 10 times faster than the conventional Lanczos method. SMS can solve problems with over 20 million degrees of freedom. • BIGDOT optimizer solves problems in excess of 3 million design variables. For example, topology optimization problems are currently being solved in excess of 3 million design variables and are getting bigger everyday.